One of the most difficult tasks in curtain cleaning is cleaning wax off from the surface of the curtains. Candles are used as accessories for decorative purposes. They are also used to give a rustic feel along with the light. Some candles absorb bad odour and give out the good smell. Mostly candles are put on the sill of windows, after the curtains and at times it so happens that curtains touch the melting wax of candles. 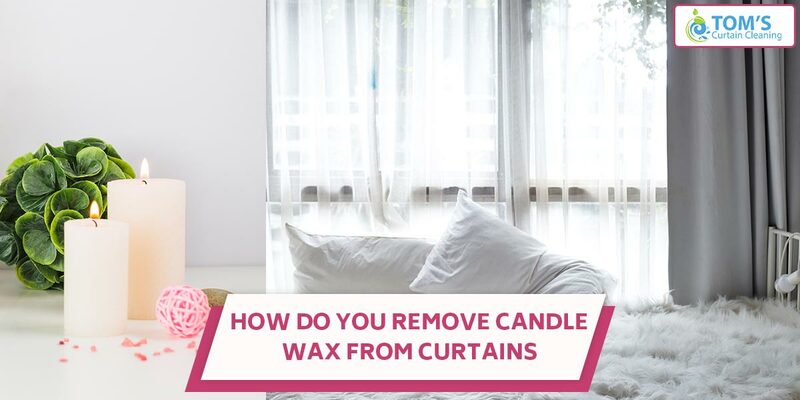 There are two major process to keep in mind while remove candle wax from curtains, first is to remove the tactile wax, and then the wax stain from the curtain. Make sure that you tie your curtains in a knot to stop them from getting burned from the candle flame. In this blog Toms Curtain Cleaning Melbourne will let you know how to remove candle wax from curtains. Remove the stained curtains from the rod they are hanging on. Fold or ball them up before packing them into plastic bags or large food storage bags. Now place these bags in the freezer, and allow them to be there for 10 minutes, so the molten wax hardens. Now place the stained curtain on a smooth, undented, flat surface. Scarpe the frozen wax off the curtains. Apply force smartly you do not want to damage the curtain material. You can use an old credit card, plastic card, butter knife or anything of the like to scrape the wax off. Layout brown grocery paper on the ironing board. Place the waxed covered area of the curtain on top of the paper. Lay another open sack on top of the curtain with the print side facing you. Set the iron to medium-high. Press it to the paper on top of the curtain. The heat will melt the remaining wax on the curtains and the paper will absorb it. Move the paper a little between each pressing, so you do not transfer the wax back onto the curtains. Continue the process until you absorb all the wax off. Put the curtains in a washing machine, and leave them to dry, before getting them ironed and hanging them to the rod again. To know more on curtain cleaning call Toms Curtain Cleaning Melbourne on 1300 068 194 to get same-day, onsite cleaning anywhere across Melbourne. What Are The Best Tips for Cleaning Lace Curtains?